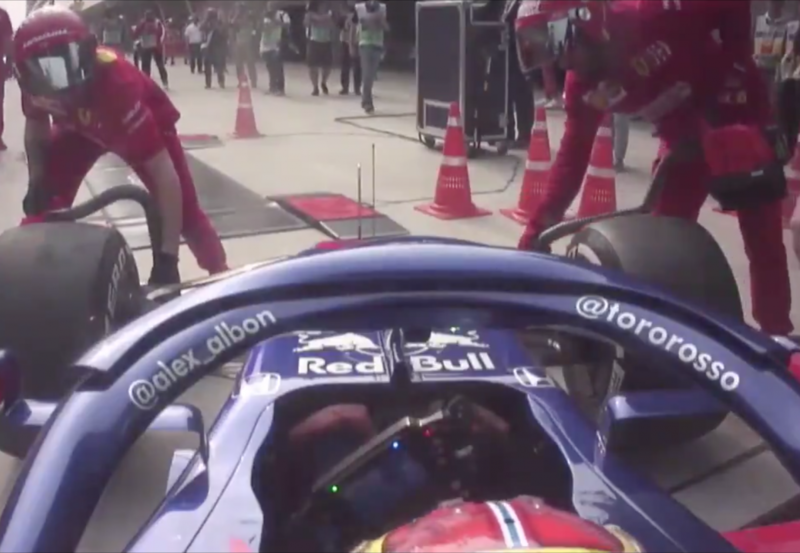 Footage has emerged of Ferrari mechanics coming to Alexander Albon’s rescue after his Toro Rosso’s front brakes caught fire while waiting to be weighed at the end of Practice 2. The onboard video shows Sebastian Vettel spotting smoke that started to appear from Albon’s overheating brakes, calling his Ferrari mechanics to extinguish the Thai’s brake discs quickly. Ferrari mechanics swiftly kept the emerging flames under control with their own cooling equipment before Toro Rosso mechanics arrived to maintain the brakes further. Formula 1 brakes can reach temperatures of almost 1000 degrees Celsius at racing speeds. The carbon discs can only be cooled down if the car is moving through the air. While an F1 car is stationary, brake discs are required to be maintained by ‘brake coolers’ which blow air directly into the brake ducts. Practice 3 starts at 1300 AEST.